Wash all the root veggies and slice off the ends. There is no need to peel them. Using a mandoline slicer, slice each veggie into thin slices. Keep the beets separate so they don't turn everything red! Heat oil to 350°F. Please use a proper thermometer! Add a large handful of the chips to the oil slowly. Stir the chips as they fry. They will shrink a lot as the water evaporates out of them. The chips are done when they are no longer bubbling. That means that almost all the water is out of the chips. This will most likely take 8-10 minutes per batch. Remove chips with a slotted spoon onto a paper towel to drain and cool. Season immediately with the spice mixture. As the chips cool, they will get crispy. I’m a big believer in making frying difficult. Let me explain. There is a lot of frying equipment out on the market now that makes frying super-easy. Items like the Fry Daddy or the more professional ProFry. You just plug it in and away you go. My problem with this is that it’s too easy. If I had one of these, I’d fry everything. So I purposefully make frying a bit more difficult. I have to get out a large heavy pot, fill it with oil, and actually monitor the temperature. Sometimes it’s still worth it though, like with these Root Vegetable Chips. These are the ugly ducklings of chips. They might not be as large or perfectly even as chips made with potatoes, but they have an amazing flavor. And you can use almost any root vegetable, which makes it really fun to mix and match. One of the keys to making these chips delicious is seasoning them with a wonderful, but simple, spice mixture. There are only five things in it, but I think you’ll agree that it’s pretty addictive. Just mix these together. You’ll have more than you need for the chips, but hang on to the extra and put it on popcorn or something. As I mentioned, when it comes to which veggies to use for these chips, you can use almost any root vegetable. Obviously, you want something round so that you can cut them into real chips. So I would avoid things like carrots or parsnips just because of their narrow shape. For this batch, I used a few beets, some turnips, and a rutabaga. There’s no need to peel the vegetables. Just rinse them off well and slice off the ends. There are two pieces of equipment that I consider requirements for making chips. For starters, you need a deep fry thermometer. It’s pretty impossible to eyeball two quarts of oil and know what temperature it’s at. They are cheap and easy to use, so just pick one up so you don’t start your house on fire. The second piece of equipment is a mandoline slicer. This makes quick work of slicing things very thinly. Could you do this with a knife? Maybe… if you are Chef Morimoto. Otherwise you’ll want the mandoline slicer! Then just slice the veggies into thin slices! With the right equipment this takes seconds. I like to do the beets last just so they don’t stain everything bright red. Anytime I’m frying something, I always like to do a test batch just to make sure that my oil is good and that I have everything set up correctly. So I tossed in a single chip and let it fry. The first chip was pretty good, but I knew I needed to let them fry longer because this one wasn’t quite crispy. Once you get a system, you can go ahead and start frying in batches! The important thing to remember about these chips is that they will shrink pretty substantially. I would say my chips shrank by about 50% because of all the water that gets cooked out of them. Use a sturdy spoon to flip the chips as they fry to make sure they are cooking evenly. Each batch will probably need to fry for 8-10 minutes. You’ll know they’re done when they aren’t bubbling anymore. That’s when most of the water is cooked out which means they will be nice and crispy. As soon as they come out of the fryer, let them drain on a paper towel and then hit them with a good pinch of the seasoning. Here are some finished beet chips, which were my personal favorite. These look kind of funky, but they taste amazing. 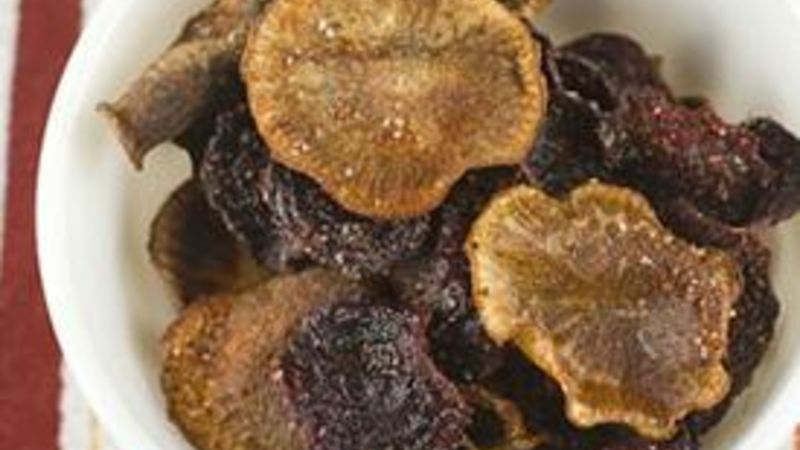 They’re slightly sweet and much more flavorful than potato chips. If you give these a shot, don’t be worried if they are slightly soft when they come out of the fryer. As they cool, they will crisp up nicely. Nick believes that somehow these feel healthy even though they are deep-fried. Be sure to check out his blog, Macheesmo, and follow him from his Tablespoon Profile.